Thu., April 28, 2011, 5:52 p.m. These are portions of phone calls from the Kootenai County Jail that were played for jurors today in the murder-for-hire trial of Edgar Steele. BOISE - Cyndi Steele testified today that she knew her husband was talking to European women online but said the communication was part of his research into Russian mail order brides. She said the two often sat in his home office reading the correspondence from the women. "We would end up laughing together, because we didn't believe it was always the pretty girl behind the writings," she testified today, the second day of testimony in Edgar Steele's murder-for-hire trial. "It could be a man as far as we knew." 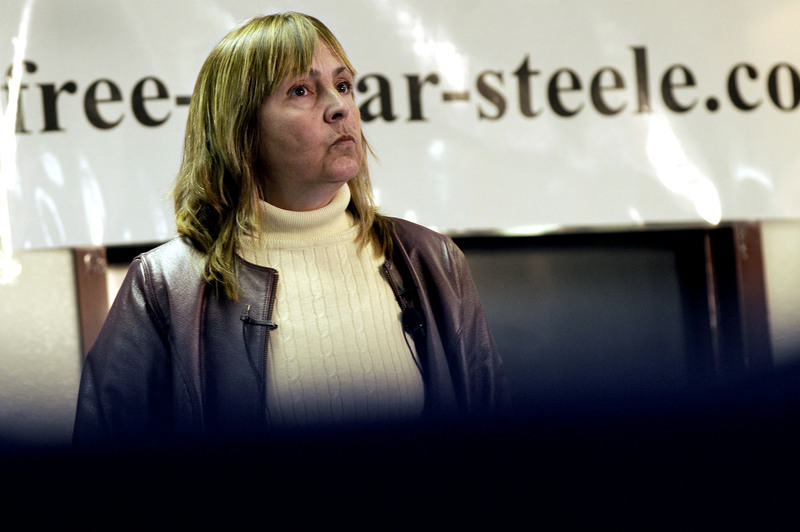 Cyndi Steele (pictured at a press conference last October) said she knew Edgar told the women he was divorced and wanted to have babies with them, though she admitted she didn't know he'd sent them pictures of their Talache Road home. "I gave him the go ahead because I trusted him," she said. "He would let me read anything I wanted; I knew what he was sending...I knew all about it, and I knew it was a case, and I knew he saw a book in it." But Assistant U.S. Attorney Traci Whelan emphasized that Cyndi Steele didn't read every email. "He was lying to you, Cyndi," Whelan said. Cyndi Steele, the victim of the alleged murder plot, said she knew Edgar wrote to one of the women, Tatayna Loginova, from the jail confessing his love. Whelan questioned why he would continue to lie for research purposes while jailed on such serious federal charges. Steele's testimony was interrupted repeatedly as prosecutors called for her responses to be stricken because they didn't address the questions. The final dispute arose just before scheduled adjournment at 2:30 .m., so attorneys for both sides will meet with Judge B. Lynn Winmill at 8:15 a.m. Friday to discuss. Cyndi Steele's testimony is expected to continue at 8:30 a.m.
Much of today's testimony focused on Edgar her husband's correspondence with other women and the couple's past marriage problems. Steele and her mother owned a dance studio in San Francisco when her mother was injured in a car crash. Someone recommended they seek counsel from a law office. Edgar Steele had recently been hired there. The Steeles married in 1985. But by the late 1990s, Edgar Steele had been diagnosed with prostate cancer, and his wife was experiencing "issues" that kept them apart, according to testimony. Cyndi Steele briefly sought a divorce in 2000 after creating a fake Match.com profile to see if Edgar, who advertised himself as single, would respond. Whelan asked Cyndi Steele if the marriage was saved because Edgar Steele said he "merely wanted to try on other women but had decided that you were the one for him." "That's a very small summary of it, but I'd say yes," Cyndi Steele said. "Because he was so unhappy, he was looking to see if our home life was really what he wanted or if there was something better," she continued. "I think he was really questioning his life about everything." Whelan then asked about this past year, when Cyndi was splitting her time between Edgar's health problems in North Idaho and her mother's health problems in Oregon. "It was very hard, because I need to be in both places," she said. "I had to go where the most emergency was...I had to weigh it, and it was hard to weigh it because I had two people who I very much loved who need me." "I can understand why he felt I was maybe neglecting him," Cyndi said of Edgar. "I hadn't been getting enough of him, either." But she emphasized that the situation was "much different" than the problems that provoked the divorce petition 11 years ago. Aftrer her husband's arrest, Cyndi Steele reported $45,000 in silver missing from the home and listed FBI informant Larry Fairfax as the suspect. Defense lawyers say Fairfax set up Edgar to cover up his theft of silver from the Steeles. But Whelan said today that Edgar had cashed about that same amount in silver last April. Cyndi said she was aware of that and factored it in when counting their silver. Jurors heard phone calls Edgar Steele made to Cyndi and their son, Rex, from the Kootenai County Jail after his arrest that led to tampering with a witness charges. Steele told his wife he feared she was seeing someone else. "I'm only suffering because I love you and I'm not getting enough of you," he said. He also urged her to stand "like a rhinoceros in the road" and tell authorities the voice on the recordings with Fairfax "was not my husband's voice." Cyndi Steele said she doesn't believe her husband was trying to unduly influence her in the call. "He was trying to tell me he was innocent, and that's what he was standing up for," Cyndi Steele said. "He never asked me to lie, and he knows I would be upset if he wrongly went to prison." In the phone call, Cyndi told Edgar that she rmembered him telling her to get out of his life after his surgery. Edgar said he made the comment while heavily medicated; Cyndi testified today that he didn't mean the comment.